Congratulations to GeekTonic Reader "vinylfreak4" who won the GeekTonic Vidabox Media Center Keyboard Giveaway. You were chosen out of over 100 entries. The winner was chosen at random with the assistance of random.org. An e-mail is on its way to "vinylfreak4" to arrange shipping for this awesome keyboard. Congratulations to vinylfreak4 and thanks to everyone who participated! Thanks also to the guys at Vidabox for providing the Keyboard for review and especially for allowing me to give it away at GeekTonic. I'll have one more keyboard review coming soon which I'll be giving away also so stay tuned. Get 10% Off the Vidabox Premium Wireless Media Center Keyboard with Laser Trackball! 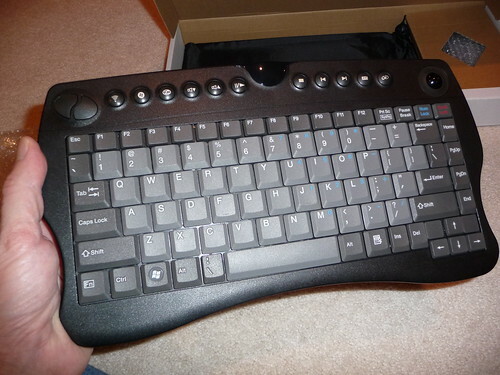 If you missed it, this Vidabox HTPC Keyboard is really nice as I said in my full review of the Vidabox HTPC keyboard. I should note that as always, I receive NO compensation for the items I review and any products given to me for review are given away to the readers of GeekTonic. This is the only way for me to keep the respect of you, the reader and maintain the trust in the reviews I write. Any exceptions to this rule will be explicitly stated. You can pick up one of these VidaBox keyboards for 10% off by putting in the code "geektonic" (without the quotes) during checkout. Thanks again to Vidabox for providing the keyboard for review & giveaway and for the discount offered to GeekTonic Readers.